Traditional kung-fu (gungfu) in the cage – favourite and contraversial topic of many discussions. MMA means “Mixed Martial Arts” – does everybody who enters the cage do Muay Thai, boxing, wrestling or Brazilian Ju-Jutsu? Can traditional kung-fu like Wing Chun (Wing Cheun), Choy lee Fut (Choi Lei Fat) or Hung Gar Kuen (Hung Ga Kyun) suceed in the sport, or is it mixing of apples and oranges? MMA Confidential’s Bruce Kivo goes inside M-1 Global Tryouts. Fighters of different disciplines try to make an impession, and controversy ensues for some. Chen Yong Fa sifu is a 5th Generation direct descendant of Choi Lei Fat (Choy Lay Fut/Choi Li Fut) founder Chan Heung. If you are in Sidney and consider to start a martial arts training, do not hesitate and visit his school – this is some real gungfu! Explosive power, natural movement, real-life and ready to go fighting combinations, excellent! I sincerelly hope i will meet Chen sifu in the near future, hopefully during one of his seminars in Poland. Check out the video below – Chan sifu and his crew are performing some nice fighting drills Chan family Choi Lei Fat. 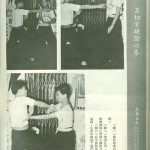 Scan from my archives – “Slicing Palm vs. Heart Stealing Fist Strike” of Fujian Wing Chun White Crane (Wing Cheun Baak Hok Kyun). Is there any connection of Wing Chun White Crane and today Cantonese Wing Chun? Wing Chun “Inside Join” (Noi Lim)? In Hung Gar Kuen (Hung Ga Kyun) we certainly have very similar technique, and old Hung Kuen is full of those. So or so, please click to enlarge and download the scan! Welcome to the Southern Chinese martial arts portal – NaamKyun.com! My name is Pavel Macek, and I am Hung Gar Kuen (Hung Ga Kyun) practitioner, teacher and researcher. Couple of years ago, i have co-founded a succeful and popular discussion forum HungKyun.com, dedicated to the art of Hung Gar Kuen, with the motto: “All Hung Kuen Branches Are One Family”. During the last dozen of years i have been conducting an intensive research of Hung Kuen and southern Chinese martial arts generally. Together with my good friend Ivan Rzounek (Wing Chun Kuen sifu) we have interviewing many old masters of various systems, collected many rare photos, articles and videos, not only Hung Kuen and Wing Chun. Together with another good friend of mine, my daai sihing Michael Goodwin sifu (San Francisco) we are working on various interesting projects concerning southern Chinese martial arts, especially translation of old and rare kung-fu manuals.